I have begun to have a quiet obsession with bandanas lately. 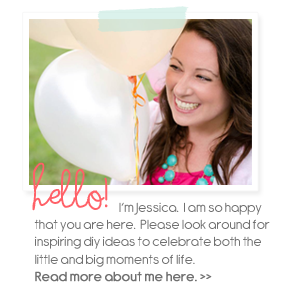 It all started when I began brainstorming ideas for the summer issue of Good Living Magazine. 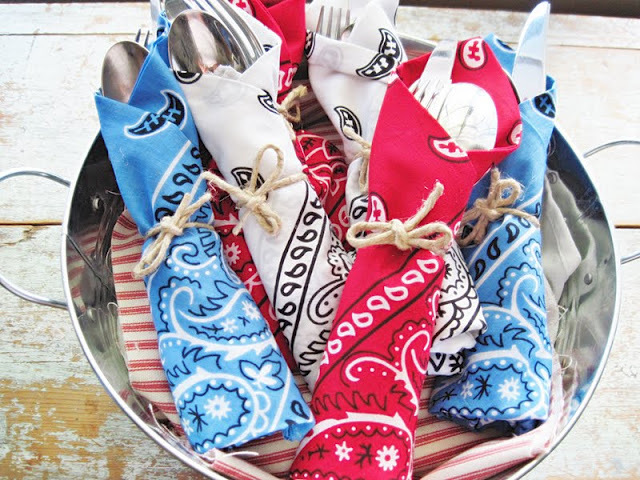 And my mind would not stop thinking about all you could do with a bandana. There are other ideas I want to try but here are the ones I loved best! 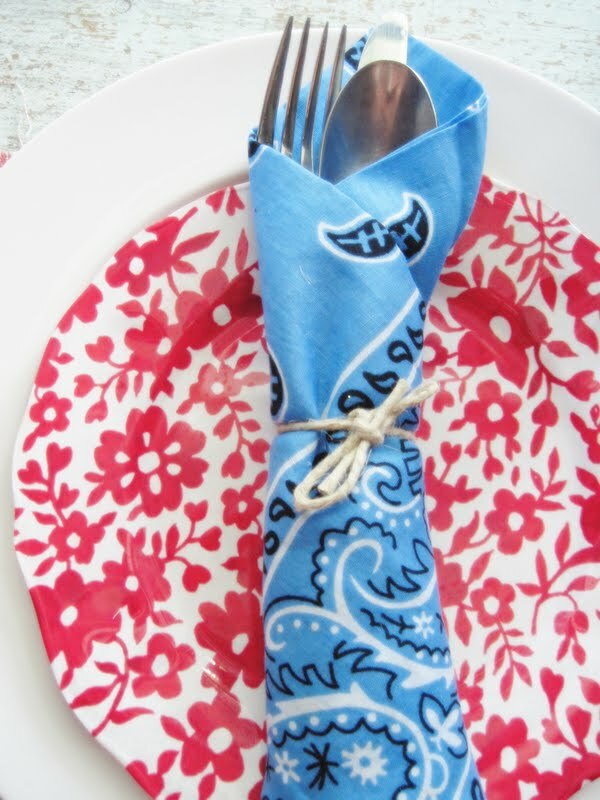 And at $1 per bandana...the creative ideas are endless! These bandanas used as napkins are as simple as you can get. I love that they are the perfect size. They look so cute with the little mason jar sippy cups. 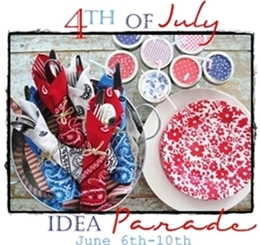 How about wrapping some favors for your 4th of July celebration? 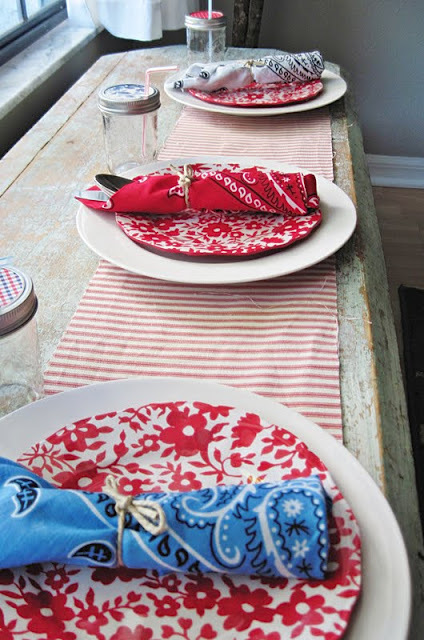 Wrap up a VERY American apple pie and tie with a bandana. Slip your pie server through the knot and attach a cute chalkboard label with twine. You can even carry this like a caddy from the tied knot. 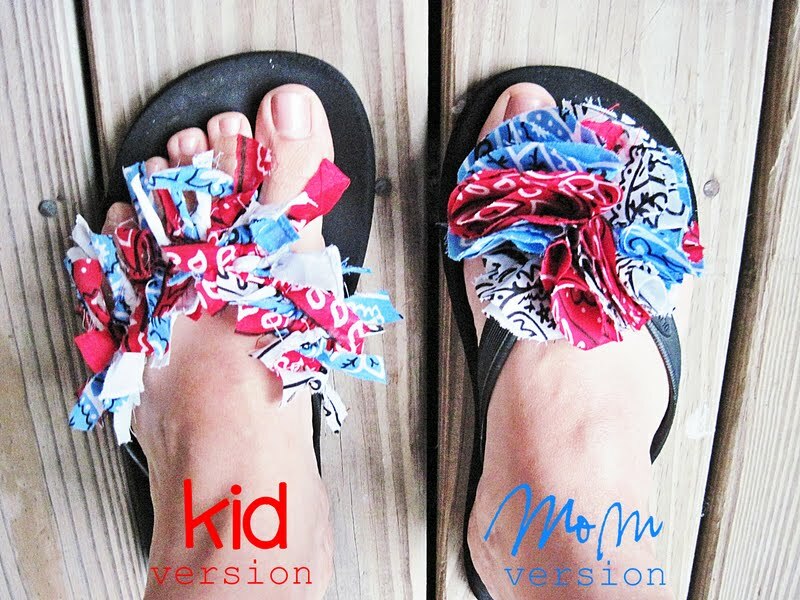 Dress up your favorite flip flops! And yes I have seriously had these for 8 years from Old Navy. I buy new ones all the time but I LOVE these. The kid version is just cut strips of bandana tied around the thong part of the flip flop. 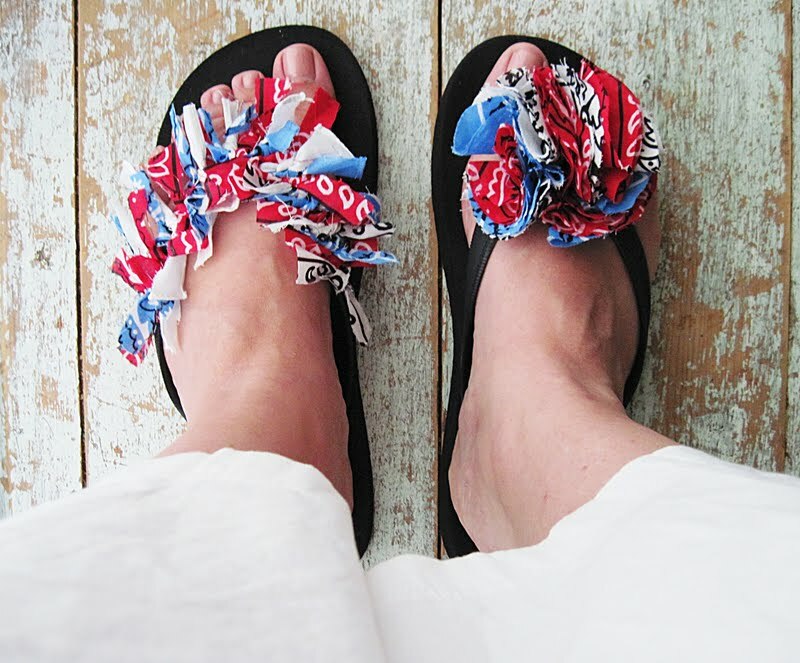 The flower is made with double folded circles from this tutorial and I sewed a strip of the bandana underneath so it can be tied to your flip flops and removed later. Or use the flower as a fun pin! Do you have some LOVE for the BANDANA now? Ok another beautiful post! Seriously how do you do it? Love, love, love all these ideas!! Who knew you could do soo much with bandana!! Very cute! 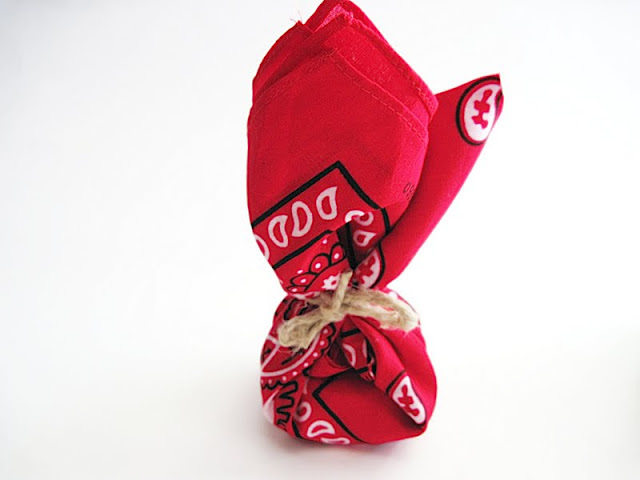 I love the apple pie wrapped in a bandana. I love bandana's, used to be you could wear them. In our town, I'm afriad if I do I might pick the wrong color or be mistaken for a gang member, awful to say I know.... I want the innocent bandana back!! Ah! I love all this stuff you're doing! Love it! The cupcakes were awesome too! Never thought of putting them on old flip flops! Anyday we are going to read that your guest staring on the Today Show as their craft consultant. I can't wait! I love this!!! I may give this a try! Such cute ideas! 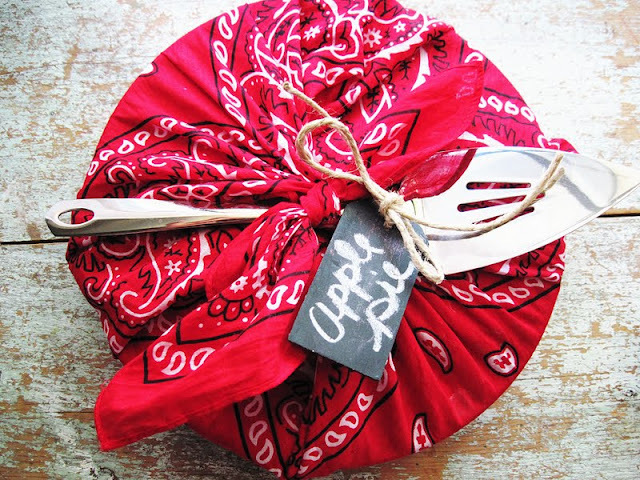 I totally want to use the bandana wrapped apple pie idea, but how did you do the chalkboard labels? Did you make them or can you buy them somewhere? I made them using little unfinished wood tags and some chalkboard spray paint. But I have even seen mini chalkboards at craft stores that you can easily make into a tag! This was my favorite one from last year too! GOOD IDEAS .I WAS ALSO TRYING TO COME UP WITH SOME IDEAS FOR THESE. 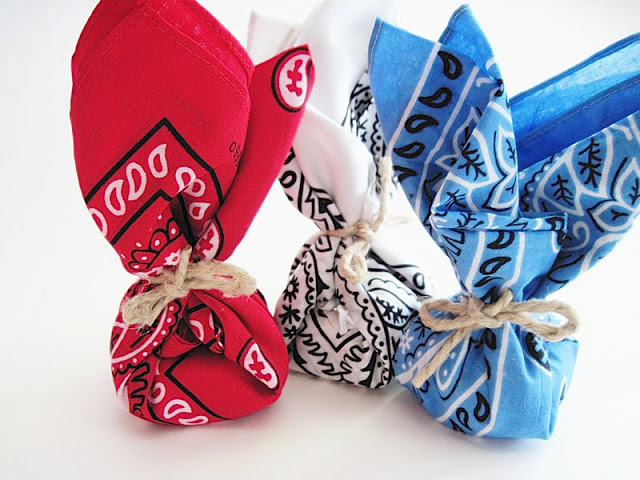 THET'RE ARE ALOT OF PRETTY BANDANNA'S ON THE MARKET NOW .IF YOU THINK OF MORE WOULD YOU PLEASE SHARE THEM WITH ME . THANK YOU . MY EMAIL IS jdcorl2002@yahoo.com i will be looking forward to hearing from you . thanks again. Peaches and Basil... Amazing Together! 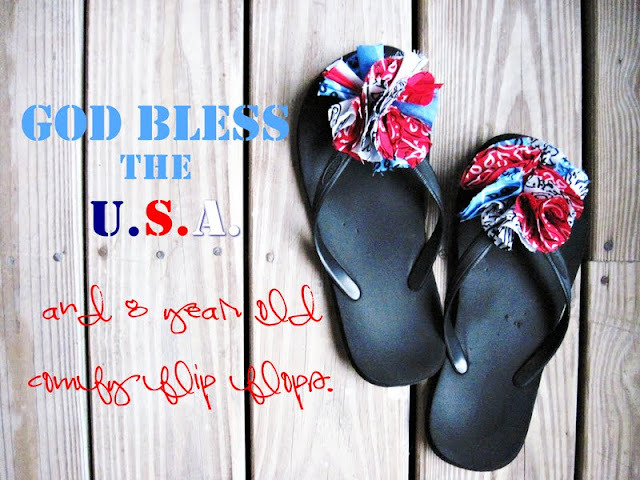 A Little Foodie Fun for the Fourth! 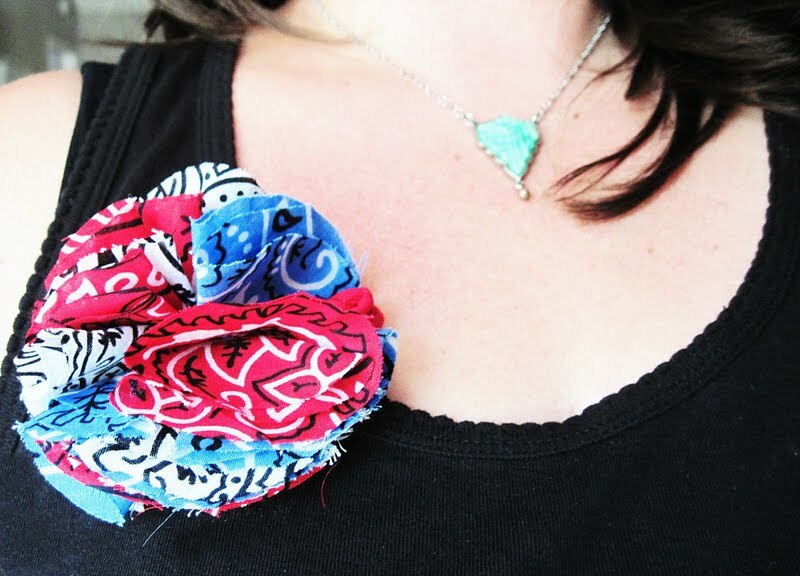 All American Rag Wreath with a Cute Little Star!